Kazakhstani investigators revealed the track of Kyrgyz special services in the murder of journalist Gennadiy Pavlyuk. Considering the nature of today’s ruling regime, there is nothing new here. The persecution of believers in the southern part of the republic, the Nookat events, the murders and assaults against politicians, journalists, public figure, the conflicts in the Petrovka village and the Balykchi events prove that current regime, its characteristics and application are the major source of troubles. Today, ignoring national security interests, Kyrgyzstan strengthens the security system of ruling clan – the criminal group that seized the power. In 2008-2009, being the parliamentary deputy, I attempted to prevent excessive consolidation of security agencies in the political system, their unreasoned interference in the civil society issues. Running the investigation, I found out that secret group, pursuing criminal interests, has been formed within the state structures. It had nothing to deal with safeguarding national security and it does not aim to ensure safer life for citizens. Its goal is to maintain the current regime at any cost. Therefore, the state still practices slighting and suspicious approach towards the citizens. Public protection Service (PPS) and State Committee for National Security (SCNS) is just the upper part of the iceberg of this organization that employs the resources and privileges of the security structures in their own interests. The organization members are especially devoted employees of SCNS, General Prosecutor’s office, Defense Ministry and Border Service. The appointments and distribution of military ranks in the last two years shows who is who. De facto we witness the establishment of junta within the state structure, i.e. the dictatorship of security officials, united by material benefits and crimes. The leader of the junta is the President Bakiev. The junta protects Kurmanbek Bakiev and prepares the platform for Bakiev Junior. Parliament, government and other institutions make sense only in the context of this strategy. The Financial police, Financial investigation Service and Audit Chamber are used with the purpose to control businesses and regulate financial flow to the benefit of the clan. All possible structures, such as Public Chamber and Kurultai, simply serve as the cover of real actions and deception. The clan relies on junta and its structures throughout the republic. The use of criminal power against political opposition and free minds of journalists is the normal practice. In other words, the junta is the organized criminal group (OCG) in the national level that employs human, financial and state resources. In May and July of 2009 I appealed to the Constitutional Court on the violation of law by President Bakiev and illegitimate results of presidential elections. In both cases the court produced the anti-constitutional and illegal decisions. This is confirmed in the OSCE final report. The country does not have independent judicial system. PPS, headed by elder brother of the president, is the main body that coordinates the junta program. In response to my inquiries on the budgets and functions of this organization, I received the clear answer – everything was the matter of state secrets. The parliament granted unlimited power to this organization. In one year the budget of this Service doubled up. It acquired very expensive special equipment and modern controlling technologies. There is special unit within the structure that is responsible for physical elimination of the regime opponents. Our analysis proved that special units may be supported by additional sources of financing such as drug trafficking and export-import operations. There are competent experts that can provide evidences of ruling clan’s participation in the drug trafficking and criminal business. Today, the special services of Kyrgyzstan are not limited in the struggle with opposition members. Looking to safeguard myself from persecution I realized that this repression engine works very selectively, pointedly and shows no mercy. The current content of Kyrgyz regime is the big danger for state development and national security. The repressed free public opinion cannot play important role in the society. The regime liquidates any potential challenge against Bakiev’s power. The repression engine continues to hunt those, who tried to identify the nature of this criminal group. Pavlyuk presented higher threat since, being an outstanding analyst and professional journalist, he could catch and report the main idea. The reprisal of General Isakov is the action, aimed to suppress any discontent in the south and army. The clan’s priority task is to control the south and not allow the emergence of the competitor for Bakiev Junior. Medet Sadyrkulov (the former Head of Presidential Administration that died under strange circumstances in March of 2009 – editorial note) was the only person that could organize the palace revolution. His murder is the warning to all opponents. Alikbek Djekshenkulov, the experienced manager, was neutralized prior to presidential elections. Erkin Bulekbaev (the leader of Green party is placed in the detention center – editorial note) was isolated as popular leader and good organizer. Edil Baisalov (former Executive Secretary of SDPK was forced to leave Kyrgyzstan-editorial note) is young; he is the serious hazard for the future regime. 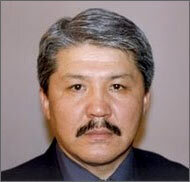 Syrgak Abdyldaev almost found those who sponsored the murder of Ruslan Shabotoev. Unfortunately, I have to admit some parts of Kyrgyz society believe that the clan continues to think about citizens. Bakiev’s family took over the power through bloody path. It strengthen the power through blood and tears of dissidents. The country will continue following the tragic route until Bakievs are in power. In order to get rid of Bakievs, first of all, we need to understand how he came to power and fortified his positions. Until the politicians fight for chairs, but not democracy, humanism and progress, the life in the republic will not get better. After 2005 Kyrgyzstan proved that in the forefront of democratic protests the power can be seized by reaction forces. My main question is: what can we do today to prevent the same experience in the future?